1. 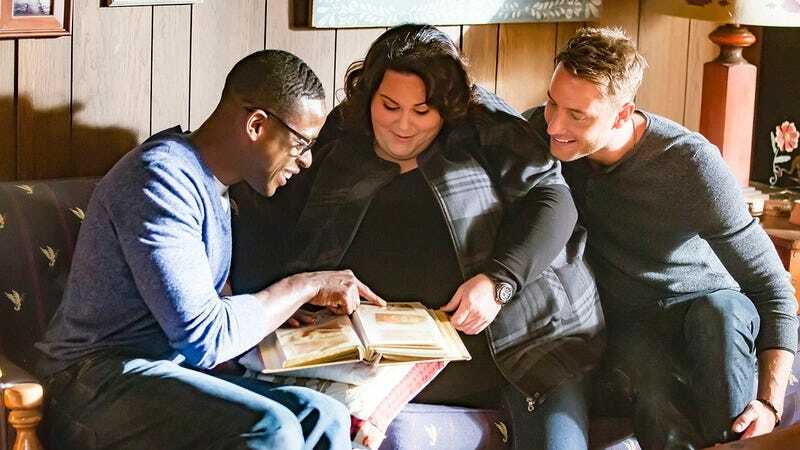 This Is Us takes place over multiple years simultaneously, with each time jump transitioning into the next with a fun graphic like a CGI bowling ball being hurled straight at the camera, or a chainsaw cutting the scene in half. 2. In each new scene, one of the characters either exclaims “That Michael Jordan is really killing it these days!” or “Remember when Michael Jordan still played basketball?” to differentiate between the past and the present. 3. NBC got the idea for the show after the success of the Friends episode where Rachel adopts Ross, Chandler impregnates Monica in Pittsburgh, and Joey turns out to be a stillborn. 4. Creator Dan Fogelman designed the show to be the perfect thing to have on in the background while you’re trying to diagnose a weird throat thing on your phone. 5. This Is Us is lauded for being the preeminent show that everyone tells you is actually really good, but you know deep in your bones that you’ll never, ever watch. 6. The show’s flashbacks perfectly capture the feel of Pittsburgh in the ’80s by having Steelers quarterback Terry Bradshaw constantly brag off screen about his ability to sustain dozens of concussions without getting any kind of brain disease. 7. Sterling K. Brown won an Emmy for Outstanding Lead Actor in a Drama Series for his performance as Christopher Darden, a Los Angeles prosecutor who gets adopted by a white family after losing the case against O.J. Simpson.